Ford Motor (s F) and partner Azure Dynamics announced this morning that they have started production and deliveries of the Transit Connect Electric work van to customers in North America and the United Kingdom. This model — an electric version of Ford’s Transit Connect van with a powertrain from Azure Dynamics and a lithium-ion battery from Johnson Controls-Saft — is the first in a lineup of five electric vehicles that Ford plans to roll out over the next two years as part of a methodical electrification strategy. First in line to receive Transit Connect Electric vehicles in 2010 are major energy companies like Southern California Edison and Xcel Energy, as well as AT&T (s ATT) and Johnson Controls, and government agencies. 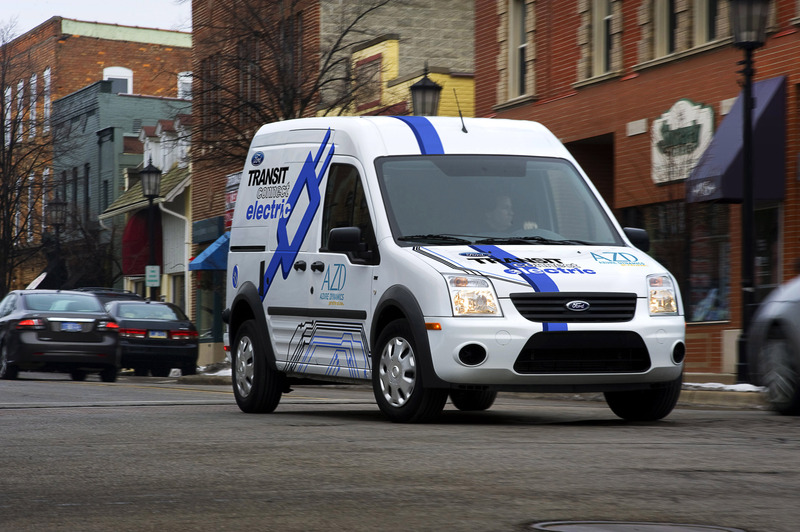 Ford plans to gradually expand the Transit Connect Electric rollout to 600-1,000 units in 2011 and twice as many sales in 2012. Ford’s plan for cleaning up its vehicle lineup amid tightening fuel economy and emission standards is more slow-and-steady than fast-and-flashy. The road map calls for finding more efficiency in conventional internal combustion engine models for the near term, while also moving ahead with hybrid technology and flex-fuel vehicles, as Ford President and CEO Alan Mulally explained at an Edison Electric Institute event last year. Next up are plug-in hybrids, although “the really compelling vision is, of course, the all-electric vehicle,” said Mulally. At this early stage of the electric vehicle market, Ford sees commercial fleets as a logical starting point. As the company noted in its release about the Transit Connect Electric this morning, fleet customers typically drive “predictable, short-range, routes with frequent stop and go driving in tight urban or suburban environments,” and the cars often “return to a central location at the end of a drive cycle making for convenient recharging over night.” Plus, large corporations buying vehicles in bulk for high mileage jobs will typically factor operating costs and fuel savings into purchasing decisions more than consumers, many of whom will not make it past the sticker shock of electric models starting at more than $40,000. Ford isn’t the only automaker targeting large fleet operators for some of its earliest electric vehicle customers. Car companies from Renault-Nissan, to Think to General Motors are targeting corporate fleets as an important first market, and General Electric (s GE) recently unveiled a goal to make half of its 30,000-vehicle fleet electric by 2015. But while cars like the Chevy Volt and Nissan LEAF are making their way into rental car and utility fleets, these models have been designed ultimately for the consumer market. That’s where Ford, too, hopes to attract EV buyers pretty soon. Late next year, the company plans to launch the Focus BEV, its first all-electric model designed for the mass market.